Festive Proposals = Festival Weddings! It’s official, December is the most romantic time of the year, with Christmas Eve being the most popular time to get down on one knee. By one survey’s reckoning 26% of all proposals take place around about now, just scroll your Facebook newsfeed for confirmation. If you see any newly decorated fingers  waving at you please reply with a link to this post.  Indeed, if you are currently sliding on rainbows and floating in a love bubble making plans for how to ‘tie the knot’, or if you are preparing yourself to pop the question and want to dangle the diamond carat of a Morning Gloryville Wedding to excite your future life partner, read on. Upon arrival we’ll create a beautiful and sacred space for your family and friends to come together and reconnect. This deep connection will be facilitated through your choice of ancient greeting rituals that have been part of humanity for thousands of years, borrowing from South-American to Pagan to Inuit influences. Experiment with OM circles and eye-gazing so that your guests covering long distances will greet each other authentically, spiritually and physically. We’ll host pre-union celebrations on the eve of your wedding. This might be a tribal dance around the fire, or something derived from nature such as the mating displays made by birds of paradise. Guests can split off to form goddess circles in the woods or howl to the moon. Altogether, we’ll practice shamanistic rituals clearing old attachments, bad energies and opening positive paths for your future. To ensure everyone gets a good night’s sleep before the big day we calm everyone with a bedtime story around the camp-fire, with marshmallows and lullabies before bed. Guests invited to start the day with light yoga, a group dance, shake-off and energy boost. Meanwhile, our creative art department and artists will be designing and coordinating show-stopping makeup and hair. Specially curated music and theatrics will be animate each cornerstone of the day according to your itinerary. Spot scattered performers re-enacting key moments of your personal love story. We’ll supply hoola-hoops and fun activities for guests in the lead up to the big moment to keep one and all entertained. We’re honoured to be friends with an array of celebrants and ordained ministers, including Sam our founding mother herself! With your guidance, we can offer both traditional and alternative union ceremonies across the faith spectrum. Finally, we get to throw the party of all parties!! Morning Gloryville will pull out all the stops to host the most fabulous, theatrical, immersive wedding-party ever. Music and dance is our thang, so leave it to us to get everyone on the dancefloor, including a “Dirty Dancing” lift. We will bring DJs, drummers and performers for a reception bash with theatrics you will never forget. Close your love-fest with a nurturing gong bath and gratitude cuddle puddle before your guests head home. We’ll supply you all with replenishing smoothies and a little stretch so your partied-out loved ones will hit the road feeling warm and fuzzy from the sheer spectacle of your glittery love-fest retreat. 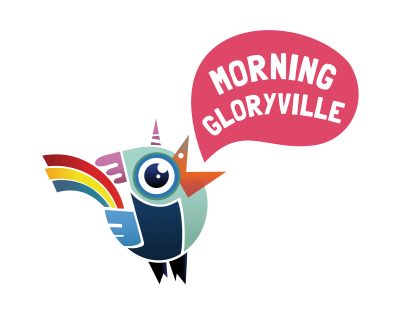 How does that sound asked Mother Morning Gloryville? The couple kissed and sealed a wish. A festive wedding proposal can lead to only one thing – a festival wedding season! Read our wedding brochure here.